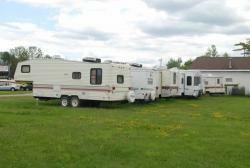 About Stayner Travel Trailer Ltd.
Stayner Travel Trailer Ltd is a family operated business in its second generation, started by founder Ronald Tapley. Ronald started working for a Toronto area RV dealership in the late 1950’s. By the end of the 1960’s he was service manager for a RV dealership called "AllTrailers" in Clarkson, Ont.. 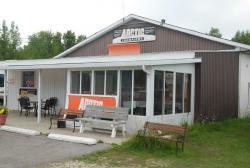 In 1974 Ron moved the family to Simcoe County, Stayner to be precise. Ron worked from the house in Stayner on weekends and evenings until 1988 when he made the RV business a full time career. In 1994 son Scott joined the company full time, leaving a career as an electrician behind to pursue the family business. Deciding to take the business one step further, Scott and wife Victoria bought 2.5 acres on HWY 26 in Wasaga Beach in 1997 where the dealership is still located today. Now retired Ron still helps Scott and Vickie occasionally. Custom built Golf Carts have become a speciality, they are known for all over Georgian Bay, Blue Mountain and Clearview: Off-road capable heavy duty carts, four seaters, cargo compartments and flat beds: You name it, STT will build it. 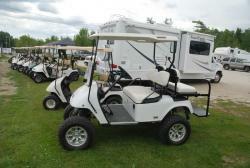 There also are a number of regular golf carts for sale at all times. 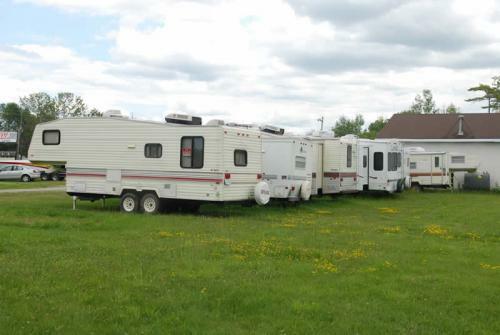 The winters are long in Simcoe County, and Travel Trailers and RVs are not exactly in season during that time of the year. Scott and Vickie decided to add Arctic Snowplows sales and service as an additional line of business. If you need heavy duty, professional grade snowplowing equipment and spare parts, come and see Stayner Travel Trailer.